Woah Dave! will make you feel like a kid again if you grew up with an Atari 2600 or played the original Mario Bros. arcade game! Developed and published by Choice Provisions Woah Dave! is a throwback to early arcade and console games! If you've ever played games on an Atari console you'll feel right at home with this title! The gameplay feels like a mishmash between the original Mario Bros. arcade game and to a lesser extent Rainbow Islands. You basically have to defeat enemies to earn coins. The more coins you earn, the more hectic the game becomes! There are also power-ups in the game including the suspiciously familiar Woah! block that clears out all enemies, eggs, and skullbombs. And the runner egg that when hatched clears out everything in its path including any players who happen to be in its path! The new Deluxe Mode in the Wii U version of the game has three stages rather than the one in the Classic Mode, and this adds a bit more replay value to the game. You can also choose between several different characters in Deluxe Mode including a few from previous former Gaijin Games titles! The game will have you hooked with its simple, yet very challenging gameplay! Be prepared for a radical challenge! The Wii U version of the game also features an option for two-player vs. matches in both Classic Mode and Deluxe which is actually the best way to play the game in our honest opinion! We had a blast with the hectic gameplay of the multiplayer! The controls in the game are incredibly easy to learn and master, however that doesn't mean that scoring big will be easy as the game has a very steep level of difficulty. The Off-TV-Play in the Wii U version is nearly perfect, however you shouldn't have your Gamepad's volume set to max as it may damage your speakers. 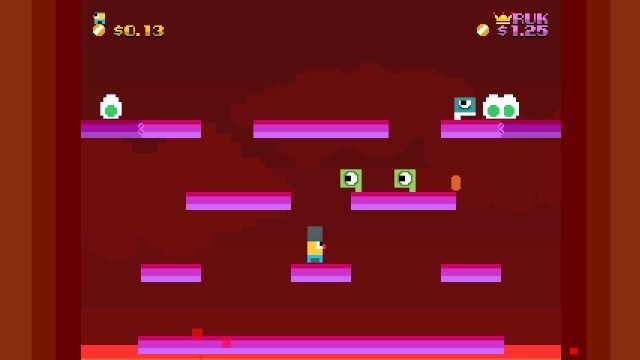 Graphically Woah Dave looks like an Atari 2600 game and despite that, it still looks better than most games on the said console so we'd so it looks pretty darn radical! The sounds and tunes in this game are typical 70's and 80's fare and will definitely bring back some fond memories for older gamers! You will die in this game, alot! The game will make you want to challenge your previous high scores! It's a true arcade classic! With great gameplay, flawless controls, and truly excellent nostalgic graphics and music Woah Dave is an excellent game for the Wii U, however the lack of content in the 3DS version of the game drags that version of the game down quite a bit. 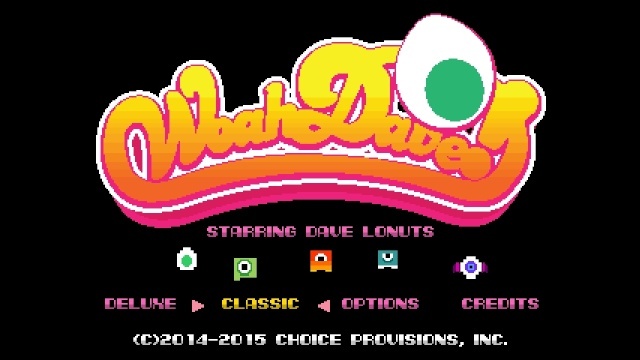 The Wii U version of Woah Dave! we highly recommend though if you don't have a Wii U we still give Woah Dave for the 3DS a solid recommendation! Good review! I agree with the scores as they're both good games, but the 3DS release felt a little disappointing.